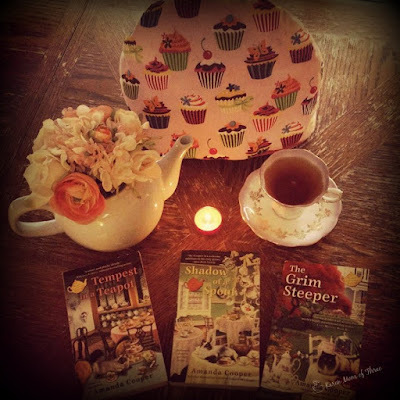 Finished The Grim Steeper! Wonderful Addition To The Series! Well I finished The Grim Steeper last night by Amanda Copper and I am so delighted with this entire series I wanted to share my photo of all three books. This was such an interesting story with twists and turns I had not expected and I was very surprised by who really was the murderer! Amanda Cooper truly found a unique way of having main character Sophie with piecing the actual murder down. I enjoyed all the old characters and Silver Spouts as well as their roles in solving the case and I think you will enjoy this story too! "Mid-October in the charming Finger Lakes town of Gracious Grove means it s time for the annual Fall Fling Townwide Tea Party. 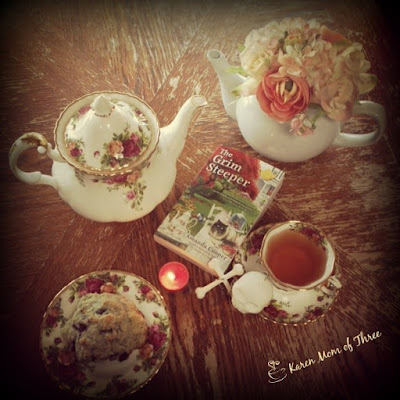 The highlight of the festivities is a roaming tea-tasting, which includes a stop at Auntie Rose s Victorian Tea House. Sophie Taylor would like to share her enjoyment of the event with her sort-of boyfriend, English teacher Jason Murphy, but Jason s dean has accused him of falsifying grades to help an athlete at the local college. Steamed and stressed, Jason shows up the night of the party with bags under his eyes. But the dean shows up under Sophie s Japanese Maple later that night, murdered, and now Jason is suspected of far worse than fudging grade reports. It s up to Sophie, her Nana, and their friends the Silver Spouts to pore over the clues to find out who really decided to teach the dean a lesson." To learn more about this series as well as other fantastic series by Victoria Hamilton/ Amanda Cooper please click here. 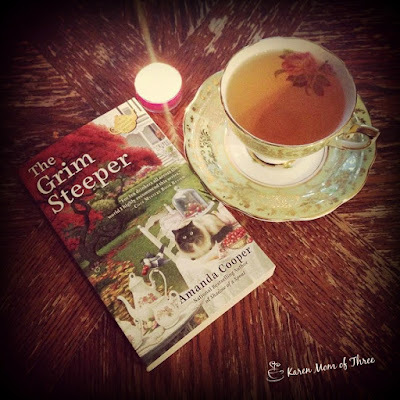 In Honor Of The Grim Steeper by Amanda Cooper I Am Having A Give Away! Earlier this week my long awaited copy of The Grim Steeper Arrived. 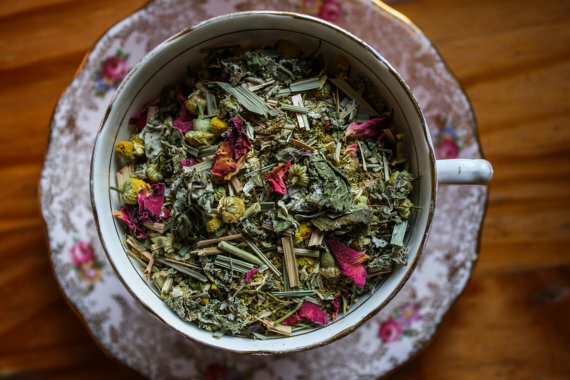 Last year Amanda Cooper, kindly enlisted my help with some information on tea steeper's and she included the information I gave her at the end of her book. I was incredibly touched to read the dedication in the book when it arrived (Yes I really did order my own copy from The Book Depository) I am so honored that Amanda Cooper included this in the book. It was a very big surprise and a simply wonderful one at that. Being that I am a cozy mystery lover as well as a loose leaf tea enthusiast, I found the most fun novelty tea steeper in the shape of a skull. I thought it would be fun to give one away to one of my readers in honor of Amanda Cooper's third book The Grim Steeper. 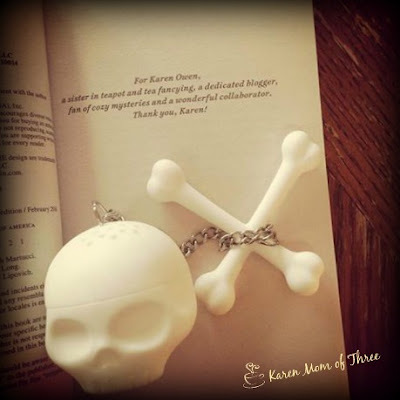 This little silicone skull is actually really useful and makes a fun accessory for tea time and cozy mysteries. If you would like to have a chance to win a Skull Shaped Tea Steeper like mine please email me at karenmowen@gmail.com with GRIM STEEPER in the subject line or leave me a comment below. I will make the draw this Wednesday March 2nd and mail one Skull Steeper to the winner. Please note that this is open to my North American Readers only. 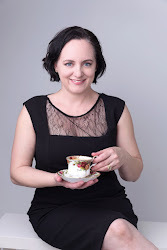 To learn more about Amanda Cooper and The Teapot Collector Mysteries please visit her website by clicking here. 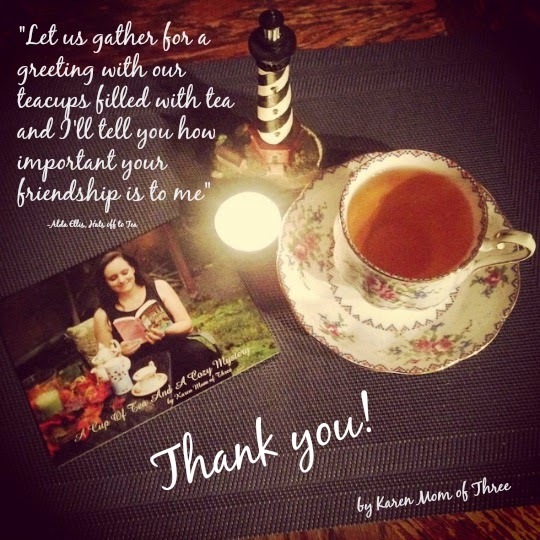 Thank you for joining me for a cup of tea and a cozy mystery and give away today! I have waited a really long time it seems to have this book on my table and as I am not half way through I must tell you that it is such a delight and a privilege to have been able to contribute in a very small way to this series. 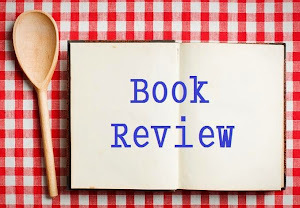 I can not wait to share the review with you soon and reveal a fun give away so be sure to check back in the next few days. This time last week my table was almost bare of cozies to read but what a difference a week makes and my TBR pile is now a small mountain! I have been able to read and review 5 books this week and such a range of books at that. 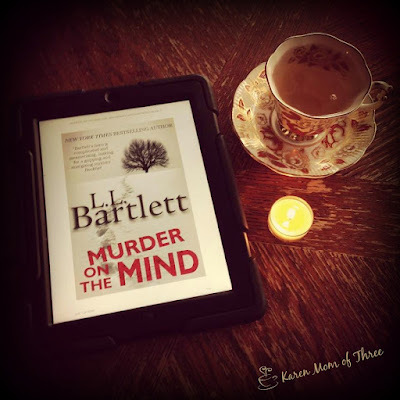 I have no idea why I waited so long to read Murder on the Mind which is currently FREE right now on Kindle AMAZON, a great paranormal mystery and read! Click here of a link to Amazon. The weather was beautiful this week and I did do some reading outside. I love my Witchy reads and this self help book called Witchy Mama is out this June and I have already ordered a paper back copy as this was a book I feel I can read and refer to often! 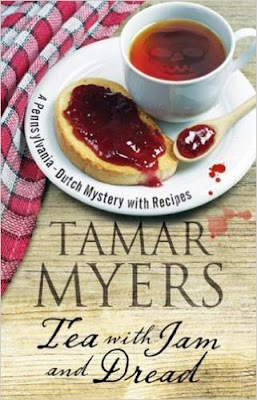 I had a great laugh with Tamar Myers 20th instalment of A Pennsylvania Dutch Mystery Tea with Jam and Dread out in May this book was delightfully entertaining.Click here to order your copy now! 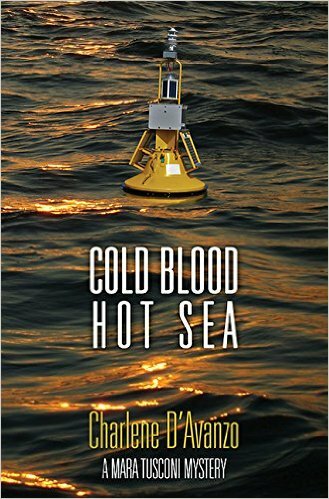 Cold Blood Hot Sea, A very good first in series from Charlene D'Avanzo and a thought provoking mystery at that! Also out in May click here to learn more. The fifth book review this week was Kernel of Truth by Kristi Abbott also a first in series and a wonderful sweet mystery. Click here to order your own paperback copy. Out March 1st! In addition to the changes in the length of my reading pile I also changed the length of my hair. I hope to have some new photos of my new do for you soon, I am terrible with a selfie so I hope you will bare with me, I feel like it is a huge change and it is shorter now then I have worn it in about 8 years. I am also very proud that my Guppie pin arrived (Sisters In Crime group) more on that later. In my cup this week I have tried 2 new teas. 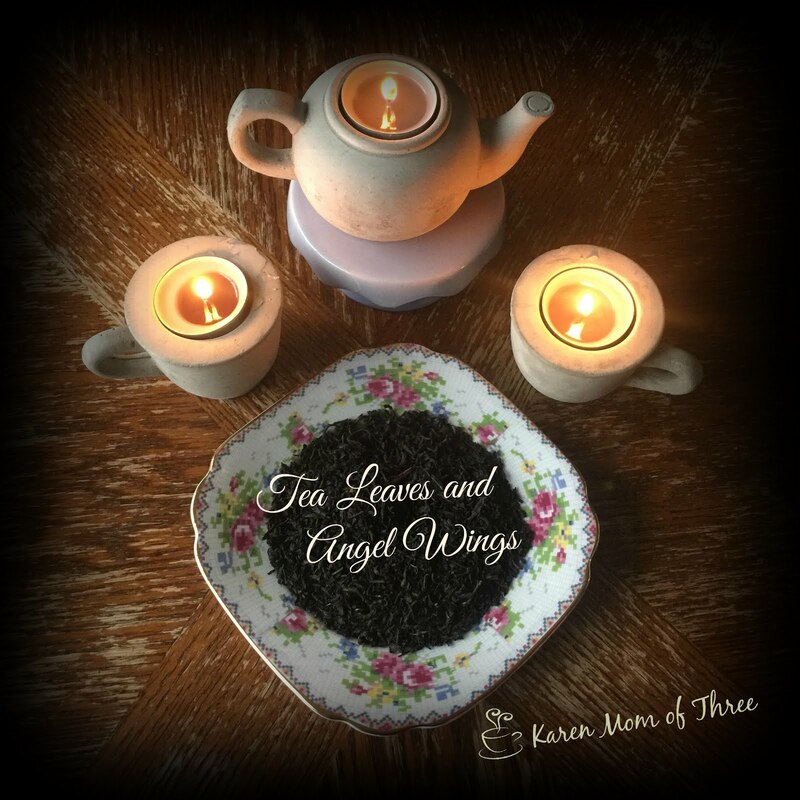 I have had a lovely Monks Blend from Steeped tea, along with a Lavender Earl Grey. I have had quite a week and hope that you have enjoyed your visits, as much as I have knowing you took the time to stop by. 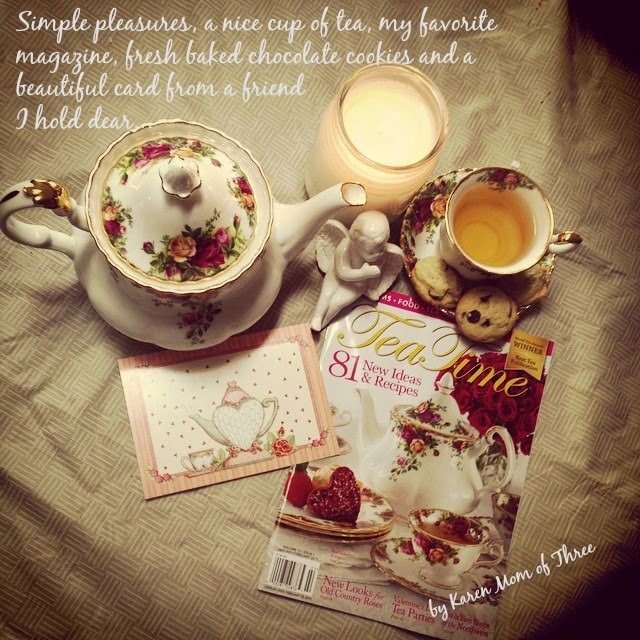 Thank you for joining me for a cup of tea and a cozy week in review. I hope you enjoy the rest of your Saturday. 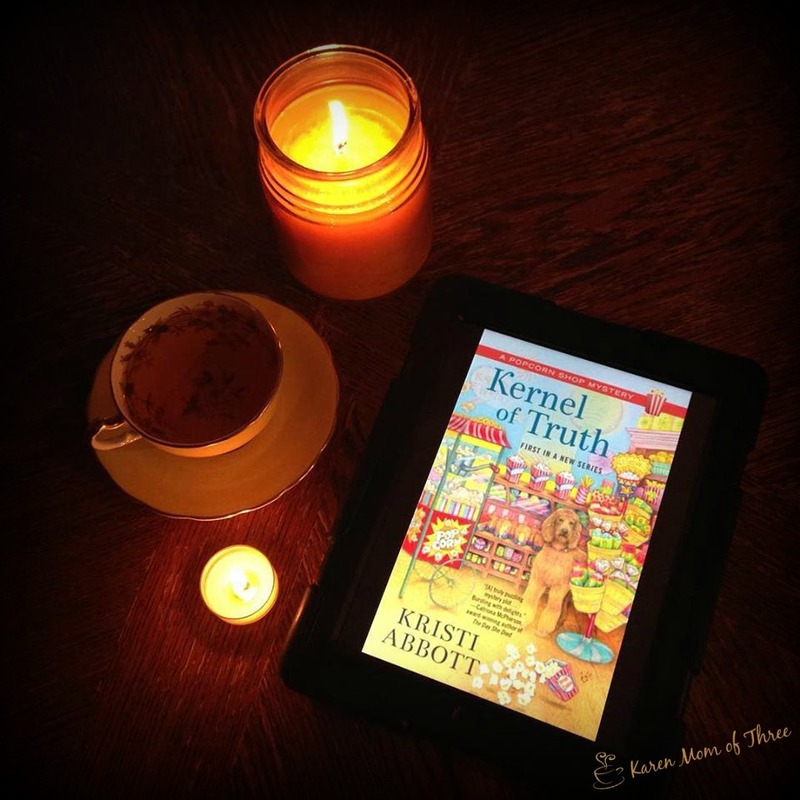 Kernel of Truth by Kristi Abbott A Sweet New Series! 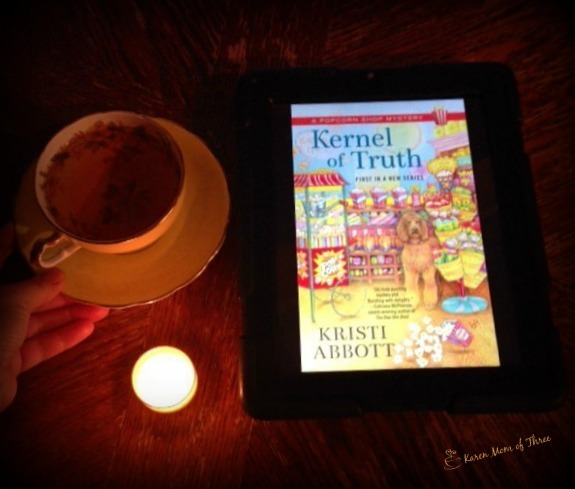 This week I was delighted to get an ARC of Kernel of Truth from Kristi Abbott. This first in series is about a gourmet popcorn shop, in a small sea side town, is out March 1, 2016. Like many cozies about main street businesses I found this one particularly endearing. A story of home coming, true friendship, finding yourself by completely getting lost and turning tail and running home. Like all wonderful cozies the lovable Sprocket Poodle adds humor, mystery and that unmistakable bond between cozy sleuth and beast! "An all-new Popcorn Shop Mystery bursts on the scene, featuring gourmet popcorn entrepreneur Rebecca Anderson and her poodle Sprocket. Opening a gourmet popcorn shop was never on Rebecca Anderson s bucket list. But after a failed marriage to a celebrity chef, she s ready for her life to open up and expand. She has returned to her hometown of Grand Lake, Ohio, with her popcorn-loving poodle Sprocket to start a new business naturally called POPS. As a delicious bonus, Cordelia Coco Bittles, a close family friend who has always been like a grandmother to Rebecca, owns the chocolate shop next door, and the two are thinking of combining their businesses. But when Coco s niece, Alice, discovers her on the floor of her chocolate shop, those dreams go up in smoke. The local sheriff thinks Coco was the victim of a robbery gone wrong, but Rebecca isn t so sure. As suspects start popping up all over, Rebecca is determined to turn up the heat and bring the killer to justice in a jiffy!" 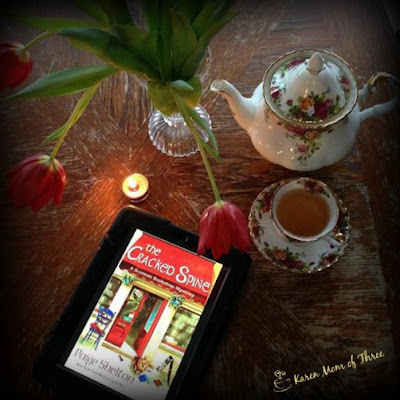 A Popcorn Shop Mystery has all the makings of a strong and fun cozy series and I hope that you will enjoy it as much as I did. 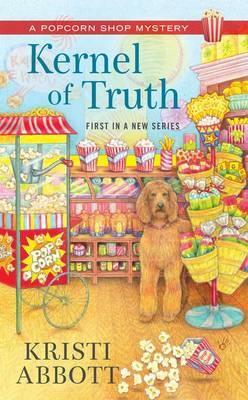 Click here to order a copy of Kernel of Truth for yourself! (Free shipping always from The Book Depository!) 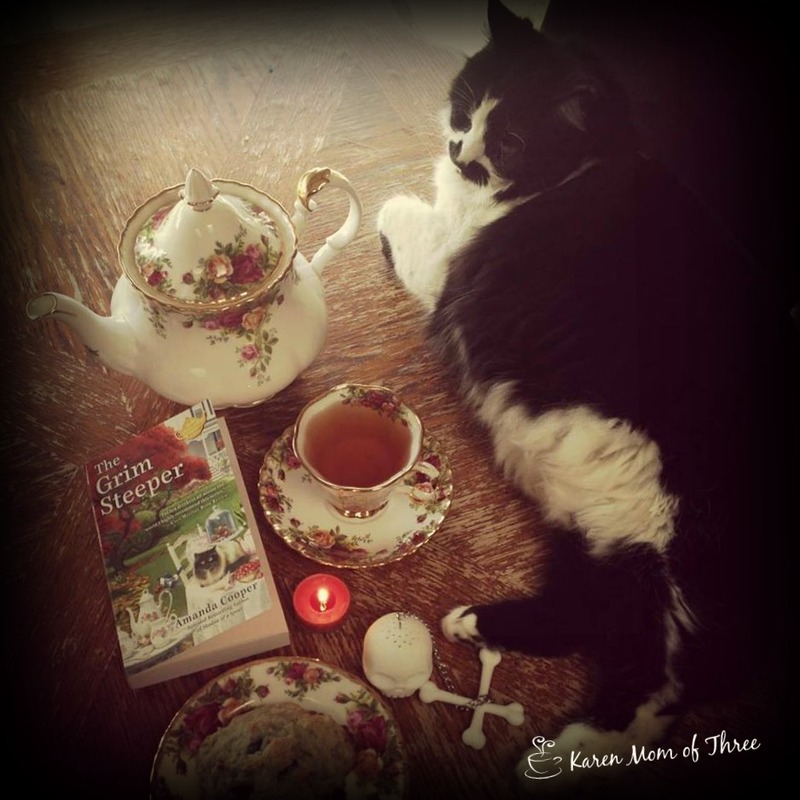 Which is a huge savings for this Canadian Cozy Reader! Learn more about Author Kristi Abbot by visiting her website by clicking here. 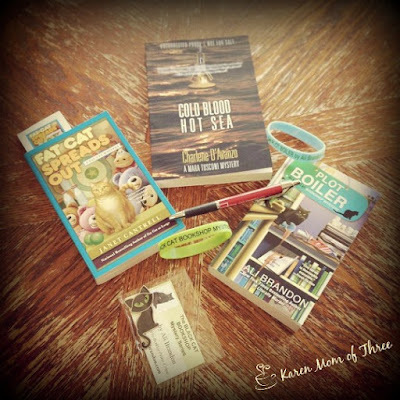 Cold Blood Hot Sea A Review , A New Mystery Out In May! 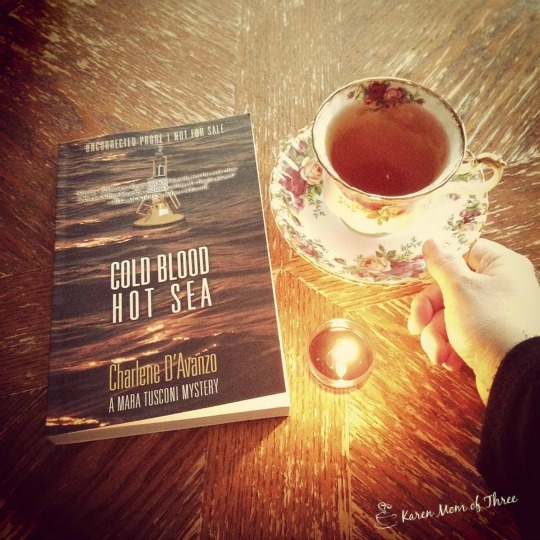 I was sent Charlene D'Avanzo's Cold Blood Hot Sea Mystery to review and after it took the very long way around to me via the mail I was thrilled to sit and finally hold a paper back in my hands again! This thought-provoking mystery novel is out May 20th, 2016. "A thrilling contribution to the new wave of cli-fi hitting the shelves, Cold Blood, Hot Sea pits climate change scientists against big energy conspirators. When a colleague is killed aboard the research vessel Intrepid, oceanographer Mara Tusconi believes it's no accident. As she investigates, Mara becomes entangled in a scheme involving powerful energy executives with much to lose if her department colleagues continue their climate change research. Mara's career-and life-is on the line, threatened by intrigue as big and dark as the ocean." As covers go I really like this one, it truly does fit the story and the lighting is perfect! This was a very well written and emotionally charged mystery. To order your own copy of Cold Blood Hot Sea please click here. To learn more about Charlene D'Avanzo please visit her website by clicking here. 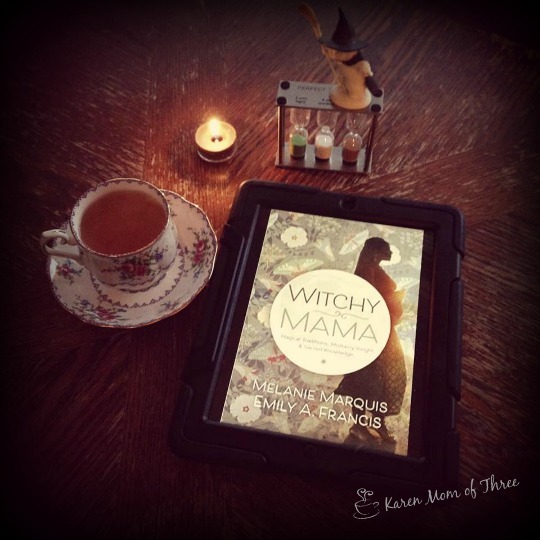 Something Different On My Table Witchy Mama An Advanced Reading Copy Of A Book I trully Enjoyed! Every now and again I like to pick up a book to help with the research for a cozy I am writing. When Netgalley had Witchy Mama by Melanie Marquis and Emily A. Francis I knew wanted to read this one. What I did not realize is that once I started reading it I was going to want to hold this book in my hands and refer to it often! 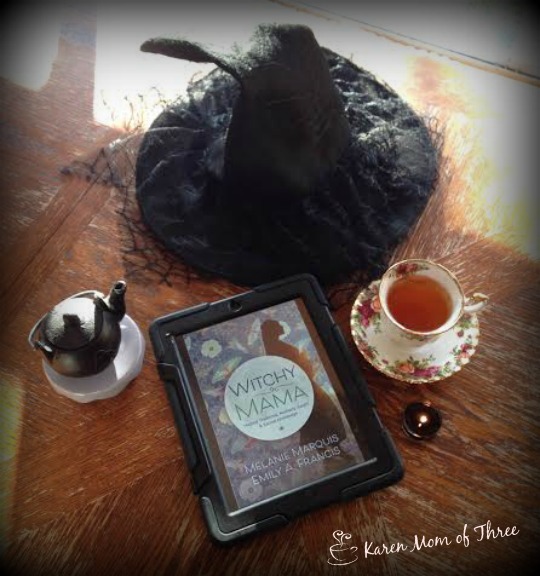 Even though I have the e-copy I have pre ordered a copy of Witchy Mama for myself from The Book Depository. There are just some books you simply must own and hold in your hands, for me this book is one of them. "Navigate the ups and downs of motherhood with a little magic! 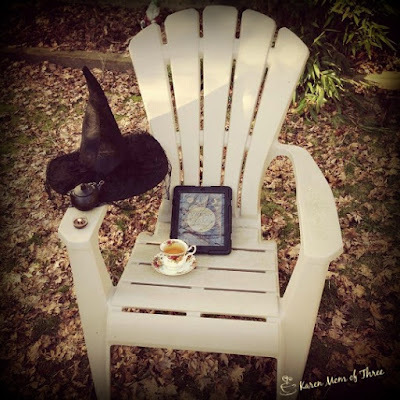 Written for mothers, by mothers, Witchy Mama offers ideas and inspiration to help new mothers create a magical home. Discover stones, scents, and colors to increase energy, reduce stress, and attract good fortune to yourself and to your family. Learn how to use simple charms and rituals to ease conflicts, banish fears, protect children, and increase happiness. Master breathing techniques and easy yoga moves that will help you feel healthy, beautiful, and comfortable throughout pregnancy and beyond. This book won't tell you how to parent, but it will help you be a better a parent while still being your own person, too." This book has some wonderful advice and recommendations for first time and new moms as well as moms like myself who have been parenting for a while now. Even if this is not the path you normally follow there is sound, promising and inspiring ideas in this book. I personally would purchase this book as a gift for another like minded mom to be, as well as friends who have been moms for years. I was very impressed with this book and can not wait to hold it in my hands. Oh and there is some really good stuff I can work into my cozy, one I hope that one day I will finish and be able to share with all of you. 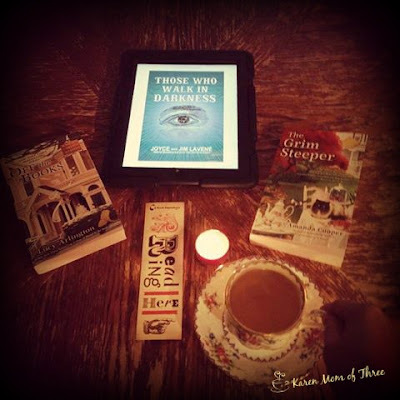 Thank you for joining me for a cup of tea and something a little different today. To pre-order your own copy of Witchy Mama for yourself or a friend please click here. Yesterday I am happy to report the mail man delivered a few new reads! Oh the smell & feel of paperbacks! 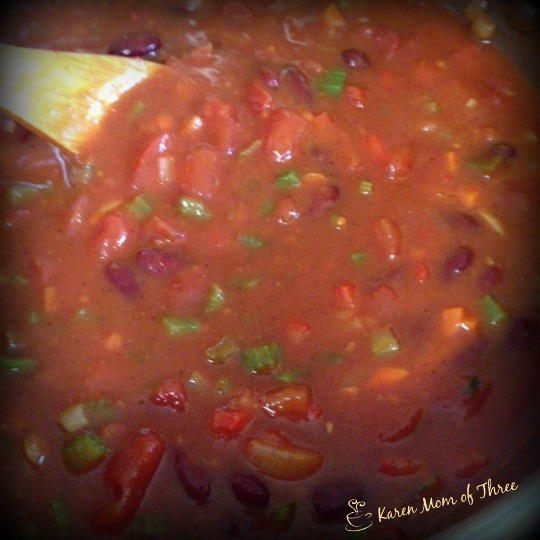 This was the most delicious chili I have ever made! Click here for the recipe. 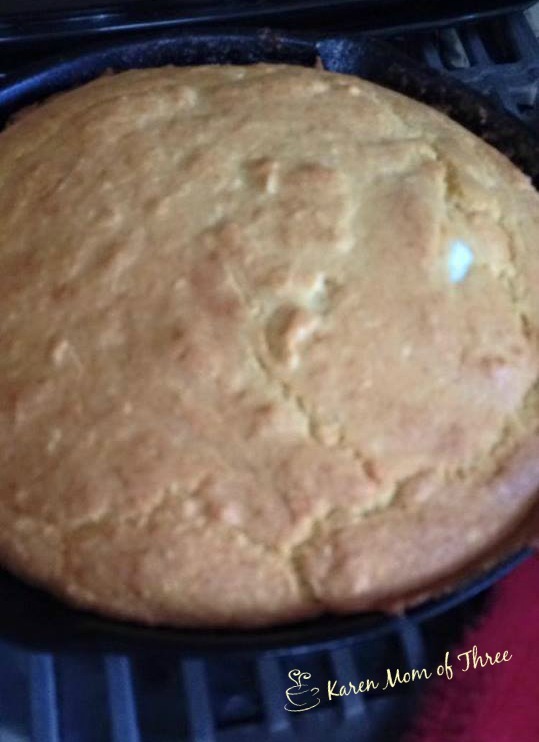 I even made cornbread that went with it. I am so excited that I have left overs for tomorrow too! With dinner done it was time to sit down to read a few more chapters in the ARC of Charlene D'Avanzo's Cold Blood Hot Sea. I hope you have enjoyed today's post and that you are inspired to make a lovely chili and cornbread yourself! L.L. Bartlett Murder On The Mind, Why did I wait so long to read this? 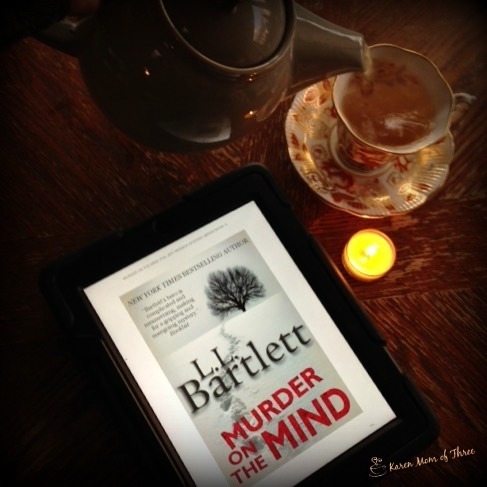 Well I honestly am not sure why I took so long to read this paranormal mystery by L.L.Bartlett (Lorraine Bartlett, Lorna Barrett) Once I downloaded it, I could not put it down! "After a brutal mugging in Manhattan leaves him with a broken arm and fractured skull, insurance investigator Jeff Resnick reluctantly agrees to recover at the home of his estranged half brother, Richard. At first, Jeff believes his graphic nightmares of a slaughtered buck are just the workings of his traumatized mind. But when a local banker is found in the same condition, Jeff believes the attack has left him with a sixth sense--an ability to witness murder before it happens. Piecing together clues he saw in his visions, Jeff attempts to solve the crime. His brother Richard is skeptical, but unsettling developments begin to forge a tentative bond. Soon, things that couldn't be explained by premonition come to light, and Jeff finds himself probing into dangerous secrets that touch his own traumatic past in wintry Buffalo--and the killer is ready to eliminate Jeff's visions permanently." I am usually weary of male main characters but I was so drawn in by the writing and even though some would argue that this is not a cozy mystery it left me with the cozy feeling. I love a book that surprises me and catches me off guard. This was immensely enthralling and a series I feel I could really get into! To read L.L. Bartlett's Murder on the Mind and find out more about this series please visit amazon by clicking here. Learn more about L.L. 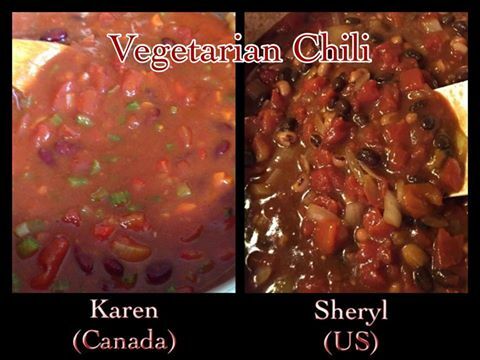 Bartlett, Loraine Bartlett, Lorna Barrett by visiting her website by clicking here. Thank you for joining me for a cup of tea and a cozy review. Tea With Jam and Dread, Delightfully Delicious and So Entertaining! Sometimes I pick books by their covers, this one I picked by the name. 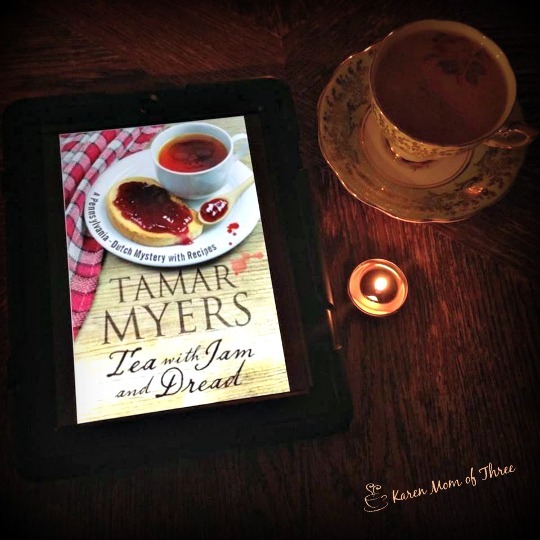 I was thrilled to be approved to read Tamar Myers Tea with Jam and Dread. This was a very funny and oddly exciting mystery. The main character is not the most believable of characters but by God she is the funniest and most witty woman of immeasurable faith. "Deciding that the PennDutch Inn needs to go more upmarket, Magdalena Yoder is delighted to welcome the Earl and Countess Grimsley-Snodgrass and their family as honoured guests, looking forward to the challenge of introducing English nobility to traditional American culture. But, as Magdalena is about to find out, the Grimsley-Snodgrasses are by no means the easiest of guests, and at the same time she has to contend with the discovery of a mummified corpse trapped in her elevator shaft.Then tragedy strikes during a traditional Pennsylvania-Dutch picnic at Stucky Ridge, when one of the Grimsley-Snodgrasses disappears over the edge of Lovers’ Leap. Did he fall – or was he pushed? And where is the body…?" 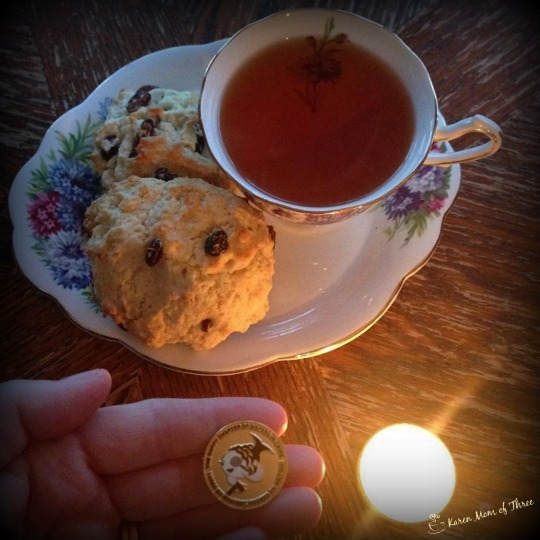 Tea with Jam and Dread was such a hoot! Very entertaining and just and all over enjoyably fun read. 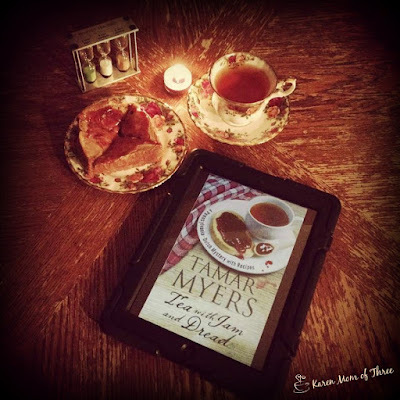 I would in a heart beat read anything by Tamar Myers in the future and look forward to looking at some past works as well. To pre order the June release of Tea with Jam and Dread from Amazon.ca please click here. This has been a Kindle App week, with out it I would not have enjoyed so many wonderful hours of reading. I am just about finished the ARC of Tamar Myers Tea with Jam and Dread, out May 1st this is one fantastic funny cozy but I will share more about that tomorrow. 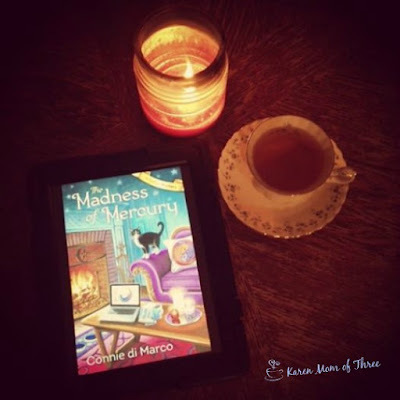 A wide range of cozy goodness on my table this week, The Madness of Mercury is a first in series by Connie di Marco, a bit on the darker side this astrological mystery I found is more of a suspense thriller. A very promising first in series awaits you in The Cracked Spine by Paige Shelton, I wish this cozy to anyone snowbound, in need of a break, a vacation or an armchair adventure. It is a wonderful idea for a series and I can not wait to see what happens next! 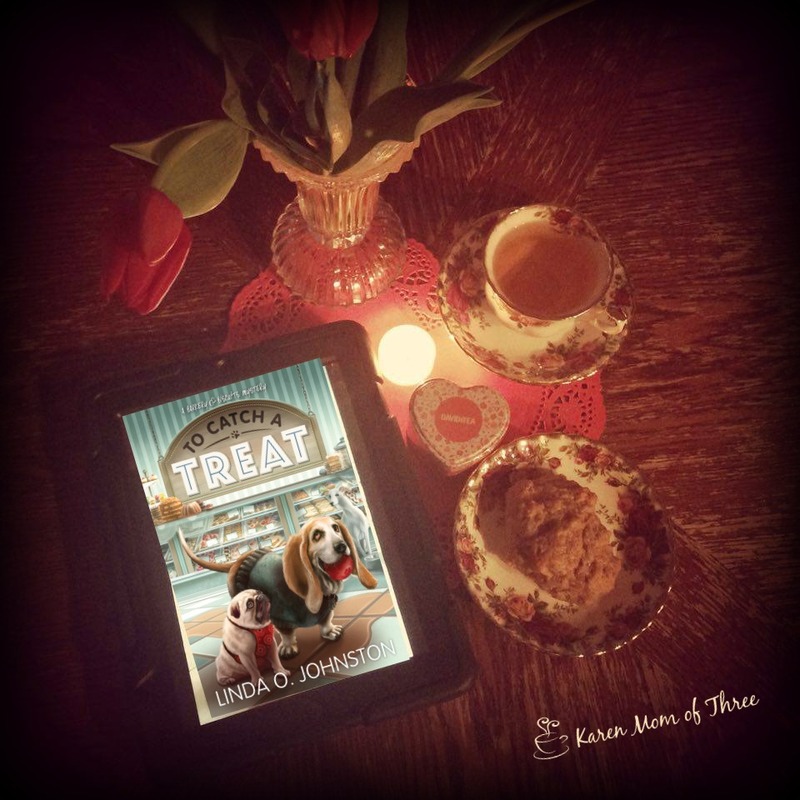 Dog lovers are going to truly enjoy Linda O Johnston's To Catch A Treat. 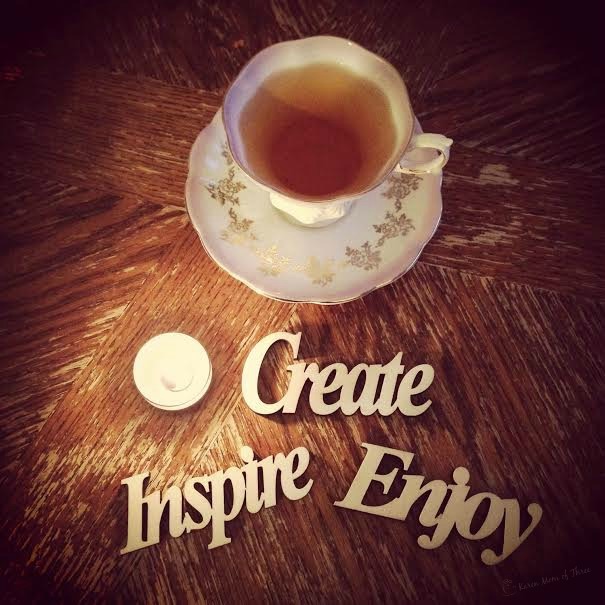 In my cup this week I had some lovely different teas mostly from Davids Tea. I had Irish Breakfast tea most mornings, I love tea #7 in the afternoons and I even had a mint blend or too. All in all this was a successful week of reading and I feel very blessed to have had so many great stories to read and write about this week. I spent the evening reading Tea with Jam and Dread, which is so far delightfully funny and I realize that I had not yet written the post for Friday, being today that is. So I typed Friday Tea in to Etsy and found a shop that specialized in tea by this name, so as I take that to be a sign I am sharing it with you today do check out Friday Tea, here are a few of my shop favorites. 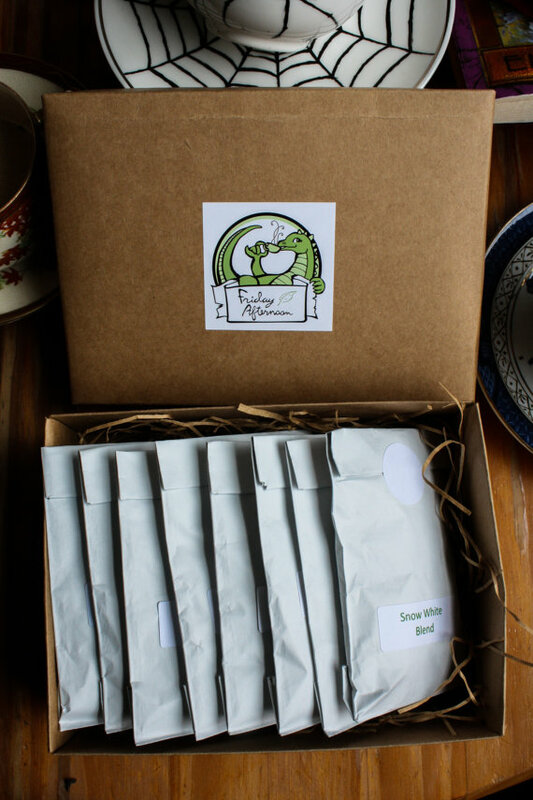 A theme blend of teas is also available and I love the idea of the different blends from not only the literary world but the Scifi world as well. 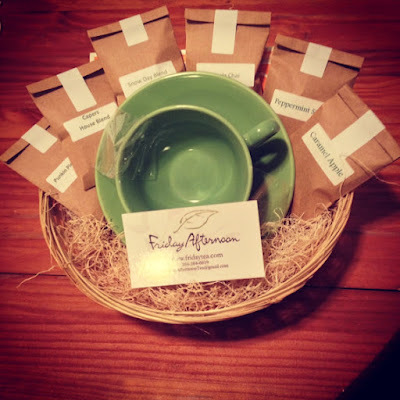 From sample packs to fun tea balls you have to check this shop out. 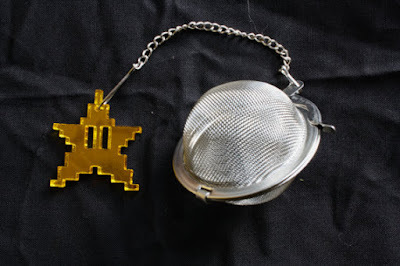 With this tea ball I may even be able to convince my boys to start drinking tea! 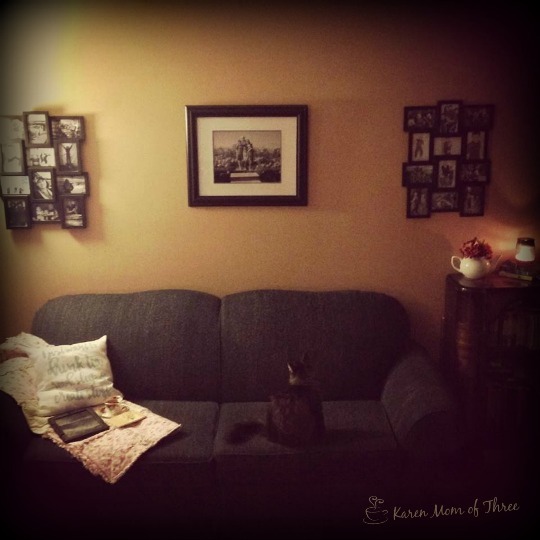 Creating A Cozy Spot Of My Own To Read. Personally my favorite place to read and the coziest spot at home is outside under my Maple tree. However it is the rainy season here and that is not really possible 7 months of the year. I want to say that I have a very cozy corner to curl up in and read in side our home but I don't. I have been wanting to and looking to change that. 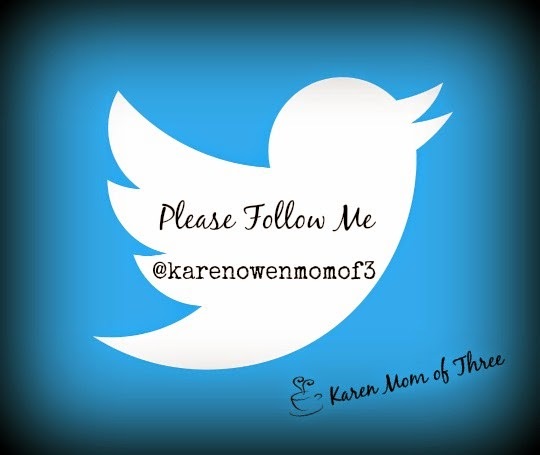 Today I am sharing with you part of that transformation. We rent and as much as I would love to carve out a corner all to myself, the best I have is this corner of the living room/dining room where I have a table and my computer. 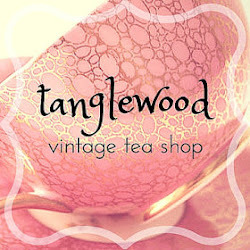 Up until now the photos of my tea at my table were as cozy as it got. 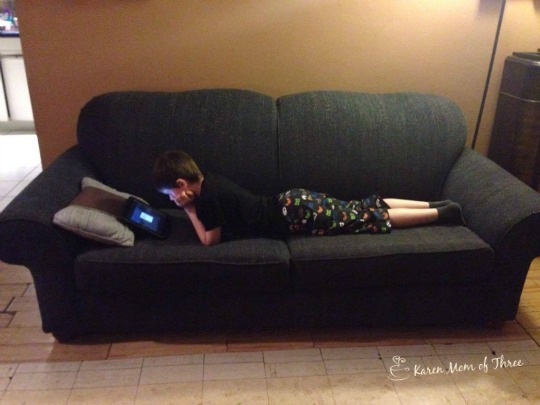 This week I got a new to me couch this week from a Facebook community group. It was better then what we had and in much better shape.The main room here is pretty much where everything happens in the house and the couch has pretty much just been where the laundry pile grows. The old couch was anything but inspiring or inviting. My problem with the new couch and the one we previously had is that they felt way to low, I always feel like I am sitting on the floor. The little legs only took the couch about 3 inches off the floor. I had an idea on how to fix that. I looked on line for couch legs but was frustrated at the price and that the highest I could find reasonably priced were only 4 inches high. I then remembered the old fashion bed legs I had on my twin bed growing up. I did a quick search and found that Canadian Tire (A large everything you need store from hockey equipment to car goods and more) had them in stock and under $15 for 6 legs. The extra inches really made a big difference! This is my new to me couch now. It was better then what we had and in much better shape. The extra 6 inches really made it feel more comfortable and I think it looks much better. Now I feel like I have a much comfier spot to sit and read. 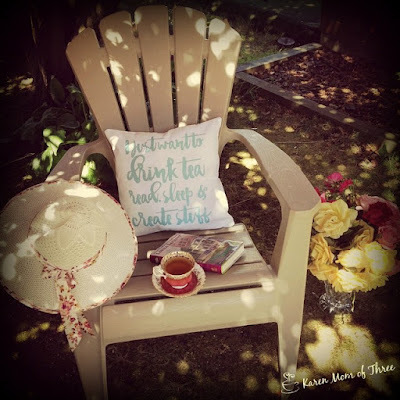 I love this pillow I ordered last year on Etsy and I have ordered myself a different pillow ( I seem to have a thing for throw pillows) that can go on the couch and look great on the chairs outside when the weather gets better. 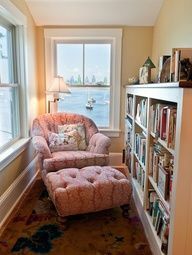 Ultimately I would love to have a very cozy corner like this one in the photo above with built in shelves (and no sign of clean or dirty laundry!) 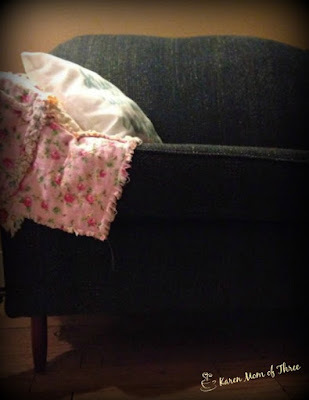 but for now I will work on keeping the couch largely clear of the piles of laundry and try to keep it as inviting as possible so that I can curl up with a good book and perhaps enjoy a cozy nap or too. I think I will go curl up there now and five in to Tea with Jam and Dread. Madeness of Mercury A New Series Out In June. 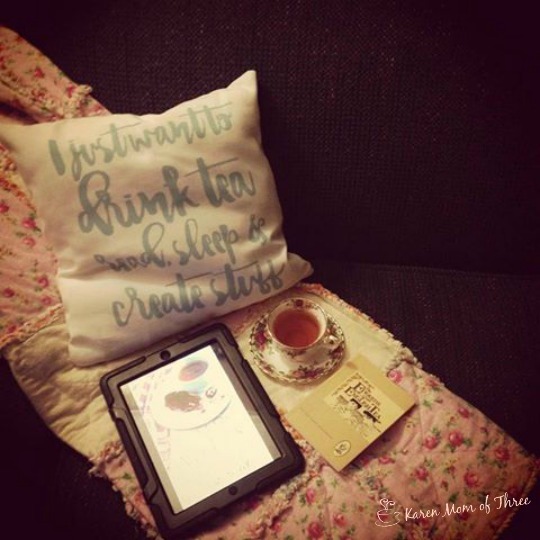 Great Deals On Two Of My Cozy Favorites!